They usually first appear during childhood. They increase during adolescence and may decrease in the elderly. Moles may get slightly darker during pregnancy. Most people have between 5-20 moles on their body. Moles are usually a brownish colour, although some may be darker or skin –coloured. They can be flat or raised, smooth or rough and some have hair growing from them. Moles are usually circular or oval with a smooth edge. 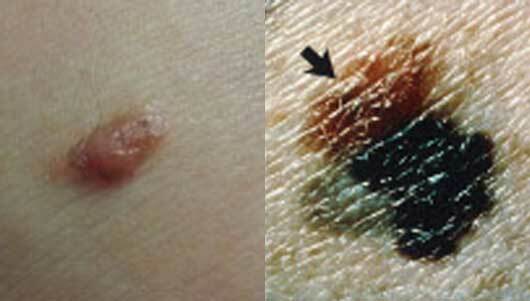 The importance of pigmented moles lies in the identification of those with potential for malignant change. Most moles are harmless, but in a few rare cases they can develop into an aggressive form of skin cancer called malignant melanoma. You should check your moles every few months for any changes. Bleeding, itching, red, inflamed (swollen) or crusty moles: if your moles are like this and have not been picked or caught on something seek advice without delay. The appearance of a new mole that looks irregular or unusual: it is normal to develop new moles as you get older but you should get them checked out if the colour does not look even or the edge looks irregular. Moles that get a lot bigger, most moles are no bigger than the width of a pencil. Moles with an uneven edge: moles are usually circular or oval with a smooth edge. If your GP/Dermatologist is concerned about the appearance of one of your moles they will either recommend a full excision (cutting out) or biopsy (taking a tissue sample of the mole). This will be sent along to the histopathologist in the hospital for analysis to make sure all is well. Further treatment may or may not be required depending on the result. The Adare Clinic specialises in the treatment of problematic moles and if you have concerns, contact us for a consultation at 01 6769810(Dublin) and 061 395410(limerick) or email info@adarecosmetics.ie. A dermatology €100. A mole removal procedure costs €260 per mole. Additional costs for histology also apply and this is paid directly to the laboratory / hospital. Private Health Insurance may cover this treatment or a portion of the costs depending on level of cover so it is worth consulting with your provider to find out about you personal level of cover. We can assist with this as we are registered with all major insurers in Ireland.